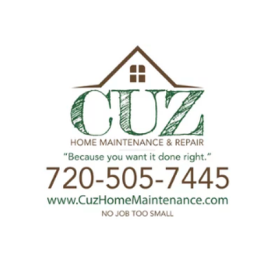 CUZ Home Maintenance and Repair, LLC provides high quality handyman services for owners of residential and commercial properties in Castle Rock, CO and the surrounding areas. We bring 34 years of experience in the industry to each job we do. We source our materials from trusted outlets and our experts use the latest technology and equipment to install them. We consider no job too hard, too big, or too small. We are insured for your peace of mind. Our services include handyman, home repair, electrical, plumbing, landscaping, landscaping maintenance, tree trimming, gutter services, junk hauling, snow removal, and sprinkler system service. We provide great work and are willing to go an extra mile for our customers. We are friendly and seek to establish longstanding working relationships with our customers by exceeding their needs and expectations at first delivery. We specialize in doing jobs that no one seems to have time for because life is too busy. We offer free estimates and reasonable pricing. Call CUZ Home Maintenance and Repair, LLC in Castle Rock, CO to discuss your handyman services needs with our experts, to request a free estimate, to schedule an appointment with us as well as to find out more about all of our available services.